One morning Mom and Dad share some exciting news, a baby is coming. The boy in the story has lots of questions, but the big one is ‘where do babies come from’. On his way to school, Olive says you have to plant a seed and the seed grows into a baby tree. When he tries to paint a baby tree in art class, it doesn’t come out just as he expected so he asks his teacher. Mrs. McClure says babies come from the hospital. Grandpa was in the hospital once to get some stones removed so he decides to ask Grandpa. Grandpa says a stork delivers them to your doorstep overnight. But the only thing at the boy’s doorstep every morning is the mail. So he asks the mailman. Roberto thinks they come from eggs, but he doesn’t know where to get the eggs. All of this is very confusing. Finally the little boy asks his mom and dad where babies come from. The explain that the baby is inside Mom. It started as a seed from Dad which was planted in an egg inside Mom. It grows there until there is no more room and it’s ready to be born. Then Mom goes to the hospital. So the boy thinks back to everything he’s been told. Olive was right about the seed and Roberto was right about the egg. Mrs. McClure was right about the hospital. But Grandpa didn’t have a clue, so the little boy decides he has to tell Grandpa where babies really come from! Sophie Blackall presents a story which is sweet and funny and absolutely appropriate for young children questioning where babies come from. The innocence of the little boy and his confusion upon hearing so many different answers is paired with the lovely illustrations. Sophie Blackall not only answers this question, there are other pressing questions about babies in the back of the book, each with a simple and direct answer. I love the boy’s persistence at getting the right answer to his question where babies come from. But I really love how he has the need to explain it to his grandpa! The artwork is endearing and heightens the innocence of the boy’s quest to find the truth. Each answer seems so appropriate for the person offering it to the little boy. 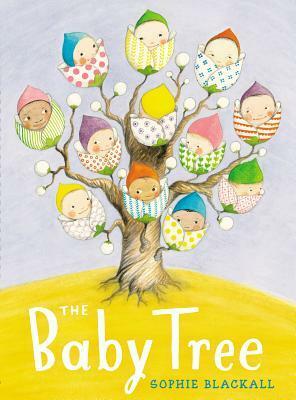 Tags: Children's literature, human reproduction, picture books, Sophie Blackall, The Baby Tree, Where do babies come from? Very sweet, I’m sure you’ll like it! Darling book. The cover at first glance looks like an Easter egg tree. This is a treasure for parents with young kids. She did a wonderful job with a sensitive subject.